Wynsome Carey joined the firm in 2008. Ms. Carey’s primary area of practice is civil litigation representing institutional clients as well as individuals in matters ranging from insurance law, divorce and family law, trust issues, personal injury and debt collection. As a supplemental part of her practice Ms. Carey also handles real estate and conveyancing matters and corporate work. Ms. Carey received her LLB from the University of The West of England, Bristol, in July, 2007 where she also completed the Bar and Vocational Course in July, 2008. She obtained her Bachelor’s Degree in Economics and Business Administration in 2004 from Acadia University, Nova Scotia, Canada. Ms. Carey was admitted to the Bar of England and Wales in July, 2008 and to the Bahamas Bar in September, 2008. Ms. Carey completed her Pupilage at AKC under Mr. Emerick A. Knowles QC. 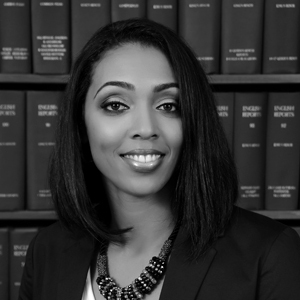 Ms. Carey is a member of The Honourable Society of Gray’s Inn and The Bahamas Bar Association.